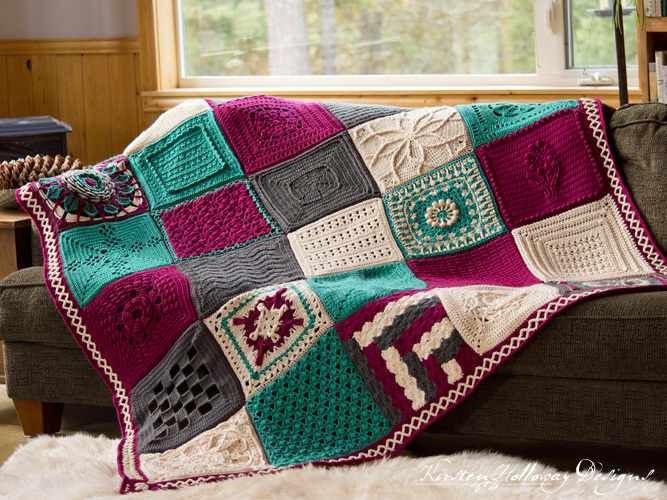 This stunning crochet blanket pattern combines color, texture and the talents of 15 crochet designers into one beautiful sampler. 26 unique granny square designs are certain to keep this crochet project fun and fresh. Crochet blankets are a special way to show your love for family or friends. They make excellent Christmas, Birthday, or wedding gifts! This particular blanket was made as a special gift for my friend, Lorene of Cre8tion Crochet. 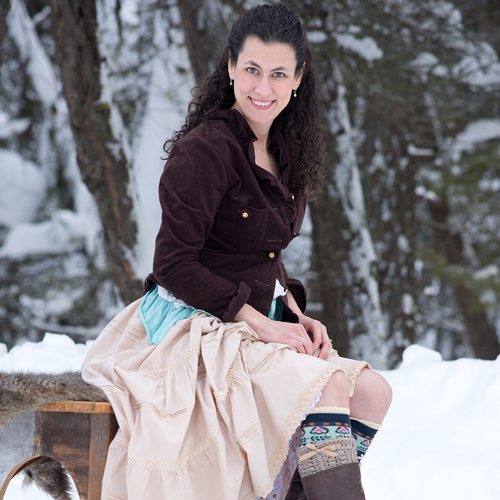 She has been running the Cre8tion Design Academy Facebook group for the last couple of years which is filled with helpful hints, and good advice to support up-and-coming crochet designers who are looking to run successful businesses. Lorene has been doing this on her own time, and in spite of real life getting in the way. She’s a crochet rock-star! With that in mind I got in touch with some of the more active group members last fall and floated the idea of crocheting a thank you gift that would be warm, comforting, and memorable. This crochet blanket is the featured Crochet-A-Long in 2019 for the Official CCC Social Group. Please click the link to join the group and follow along as we make this together! The dimensions of this blanket pattern, including trim which is not included in these instructions–look for it in an up-coming CAL in the new year–are 65″ by 77″ (that’s 5 x6 squares). This is larger than a standard throw, but smaller than a standard Twin afghan. Feel free to make more of your favorite granny squares and put them in if you want to crochet a larger blanket. The squares can be arranged any way you choose, but the list below will give you the layout that was chosen by our team of designers, if you wish to make an exact replica (it is also a must for following the boarder instructions a little further down). The squares will give you hook information. Do not follow the hook size listed on the yarn label. Follow the individual designer’s hook size/gauge. Each square should measure 12″x12″ when completed. The Way it Goes Square has a fun design that almost looks as if it’s almost twirling. The center stitches add a texture for a lovely, eye catching design. A simple square with trinity stitches to add just enough texture to look like little seashells on a white sandy beach. This simple stitch gives the look of bamboo blinds with the fading blossoms in the wind. A highly detailed motif reminiscent of ice crystals and sparkling snow. Share the love with many kisses by combining an X-stitch and double crochet to create a simple, elegant layered square. A highly textured square that incorporates elements of a rose, and succulent petals. A “picture frame” style square in Kirsten’s popular Primrose & Proper stitch pattern. Starts in the round from the center, then changes to a square mesh pattern, resembling a flower surrounded by a fence. This square is textured and thick, perfect for pot holders, trivets & blankets. The stitch design gives the fabric interest; even in solid colors. Victorian Lattice Square – Stitched by Emily of Fiat Fiber Arts. An intermediate stitch that adds elegance to any project and works up quickly. Simple textured stitches mimic the classic look of a sand dollar hidden in the tide line. Post stitches create a delicate snowflake. A floral shaped centered square with windowed accents throughout. Katherine’s Rose 12″ Square stitched by Emily of Fiat Fiber Arts. The changing Tides square celebrates friendships, and new beginnings. The Ocean Kiss Afghan Square uses a large X stitch with a cluster to give you rows of kisses! The details in this fun, two toned square resemble musical notes. Post stitches, puffs, bobbles and popcorns are all combined to make the pretty textured flower on this afghan square. Planned color changes and twisted loops look like a bright, midnight star. The Cross-rib square combines cross stitches and ribbed stitches to create a unique texture. A reversible square of offset lacy triangle shaped stitches that provide an elegant look. A beachy crocheted take on the traditional Log Cabin Quilt pattern. A texture filled square that incorporates a few unexpected stitches. Features a floral center encapsulated by ice inspired crochet stitches. You may use the joining method of your choice. I used a slip stitch join and used an invisible decrease. If you’re not sure how to do that, here is a video by Moogly showing the technique on a sc and dc stitch. The invisible slip stitch decrease is the same idea–hook under the front loops of the next 2 stitches, pull your yarn trough both and then through the loop on the hook. Edit: I found a tutorial that shows a technique very similar to the method I used, and gives it a name! Try the Zipper Method. The crochet border was something I free-handed on the fly, and I don’t have a proper pattern written out yet. However I have some notes that may help if you are familiar with the diamond stitch. If you are not, I recommend you watch this video by Hopeful Honey. Attempting this boarder without being comfortable with the Diamond stitch will only frustrate and confuse you. THIS IS NOT A COMPLETE PATTERN, and requires a little “eyeballing” to line things up–Follow this at your own risk. 😉 I will not be able to answer any specific questions at this time to help. Hopefully things will be different in January for the CAL. Round 2-3: ch 1, sc in each sc st around. In corners work (1 sc, ch 1, 1 sc), join with sl st to first sc. Round 4: ch 1, sc in next 2 sts, *join Off-White yarn, FPtr2tog placing first leg around first sc of round 2, sk 3 sts, place second leg around the next sc in round 2. Pull up berry color through last 2 loops of FPtr2tog, sc in next 3 sts on round 4. You’ll want to make sure you skip the sc that the FPtr2tog lays in front of. Continue working the diamond stitch along the edge of the blanket. When you have about as much “Berry” space left between your beginning corner and the first “off-white” diamond stitch, pull your berry yarn up and sc in the next 6-7 stitches, pull up “off-white” yarn, and work this next bit in the ch-2 sp at corner from round 1 (3 tr cluster, ch 2, 3 tr cluster, ch 2, 3 tr cluster), pull up berry yarn in final 2 loops of tr cluster, and sc in next 6 sts; repeat from * on each side around, join with sl st to first sc. Round 8: ch 1, sc in each sc st around. In corners work (1 sc, ch 1, 1 sc), join with sl st to first sc. Round 9: Using 4 mm hook, and tight tension, crab stitch or reverse single crochet in each st around.